1. HERE’S HOW IT WORKS: Entrants must be Oklahoma state residents and eighteen (18) years of age or older on date of entry to be eligible. All entrants must have a valid driver’s license and proof of sufficient insurance. Sweepstakes begins at 12:00AM CST on 02/04/19 and ends at 11:59pm CST on 03/04/19. 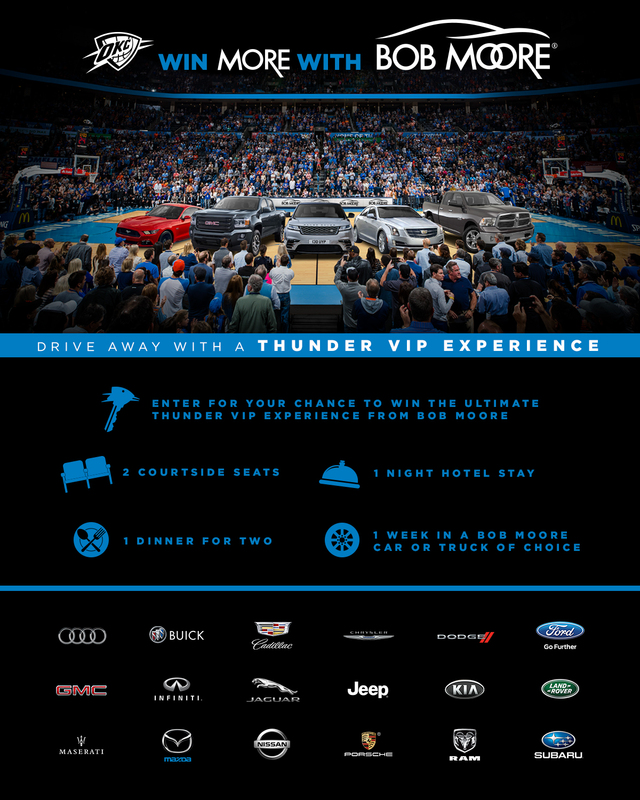 All entries can be made online at OKCTHUNDER.COM, by test driving a vehicle at a Bob Moore Dealership or through postal mail. Entrants will receive three entries into the sweepstakes by taking a test drive at any Bob Moore dealership between February 4th and February 23rd. Entrants are limited to one test drive for entries into the sweepstakes. 3. PRIZES: One (1) winner will receive two (2) courtside level seats to one (1) regular season Thunder home game, one (1) night stay in a local hotel the night of the chosen Thunder home game, dinner for two (2) at a downtown restaurant (up to a $200 value), and a one (1) week rental in a vehicle that has an equal or lesser value of $70,000 from any Bob Moore Auto Group dealership of the entrants choosing. Available prized vehicles will be identified by Bob Moore management at the time of prize redemption. 4. PRIZE REDEMPTION: Winner will be notified via phone or email by March 15, 2019. Winner must claim prize within 15 days of notification. 5. ELIGIBILITY: Promotion open only to legal Oklahoma State residents who are 18 years of age or older, as of date of entry. All entrants must have a valid driver’s license and proof of sufficient insurance. Employees, officers and directors of Bob Moore Auto Group, the Oklahoma City Thunder, the National Basketball Association and its Member Teams, NBA Properties, Inc., its Teams an Operators, and their respective parents, subsidiaries, affiliates, partners, dealers, advertising and promotion agencies, manufacturers or distributors of sweepstakes materials and their immediate families (parents, children, siblings, spouse) or member of the same household (whether related or not) of such employees/officers/directors, and their respective parents, subsidiaries, affiliates, directors, officers, governors, distributors, advertising and promotional agencies, their immediate family members and/or those living in the same household of each are NOT ELIGIBLE. Void where prohibited by law. All federal, state and local laws and regulations apply. All federal, state and local taxes are the sole responsibility of Winner. Sweepstakes may only be entered in, or from, the state of Oklahoma. Entries originating from any other jurisdiction will be deemed ineligible. 6. GENERAL RULES: By entering, entrant agrees to hold harmless and indemnify Bob Moore Auto Group, the Oklahoma City Thunder, the National Basketball Association and its Member Teams, NBA Properties, Inc., its Teams and Operators, and their respective parents, subsidiaries, affiliates, directors, officers, governors, employees and agents against any and all liability, damages or causes of action (however named or described), with respect to or arising out of (i) entrant’s participation in the promotion, or (ii) the receipt or use of the Prize awarded herein. Acceptance of prize offered constitutes permission to use winner's name, voice, biographical information and/or likeness for purposes of advertising and trade by Bob Moore Auto Group, the Oklahoma City Thunder, the National Basketball Association and its Member Teams, NBA Properties, Inc., the Women’s National Basketball Association and its Teams and Operators, WNBA Enterprises, LLC without further authorization, compensation in all media now known or hereafter discovered worldwide and on the World Wide Web without notice or review or approval as permitted by law. By participating in these sweepstakes, entrants agree to be bound by these Official Rules and the decisions of the Sponsors. Sponsors not responsible for any typographical or other error in the printing of the offer, administration of the sweepstakes or in the announcement of Prize. By accepting a prize, winner agrees to release and hold the NBA, its Member Teams, NBA Properties, Inc., NBA Media Ventures, LLC, York, their affiliates and subsidiaries harmless from any and all losses, damages, rights, claims and actions of any kind resulting from acceptance, possession or use of any prize, including without limitation, personal injuries, death and property damage. By participating in this sweepstakes, participants agree to be bound by the Official Rules. 7. WINNERS LIST: For the name of the Winner, please send a self-addressed stamped envelope with first-class postage affixed to: The Oklahoma City Thunder attn: Bob Moore Sweepstakes/Jordan Horn, 208 Thunder Drive. Oklahoma City, OK 73102. Requests must be received by 3/30/19.